IslayBlog.com -> 2007 -> The Ninth Distillery For Islay? The Ninth Distillery For Islay? At the moment Islay has eight whisky distilleries. 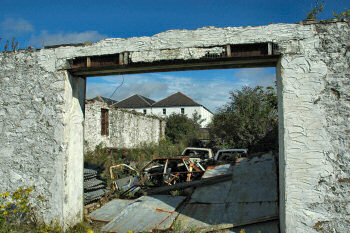 Could the ruins you can see on the right soon be part of Islay's ninth distillery? I've heard of the rumour before, although nothing of it has been mentioned on the Bruichladdich Distillery website so far as far as I'm aware: Apparently Bruichladdich is planning to open another distillery on Islay in Port Charlotte. The WhiskyCast Episode 78: February 11, 2007 has an interview with Mark Reynier, where he speaks about the plans to ‘rebuild’ the old Port Charlotte Distillery. The distillery was founded in 1829 as Port Charlotte Distillery, over the years changed its name to Rinns Distillery and Lochindaal Distillery until its closure 100 years later. Bruichladdich owns what's left of the distillery and are currently using the old warehouses to mature their Port Charlotte Single Malt Whisky. Other parts of the old distillery are used by the Port Charlotte Islay Youth Hostel and the Islay Natural History Trust. And finally some parts of it look like in the picture above. Looks like a lot of work to me. Either way, this should be an interesting project to follow.